Big Sky Botanicals Hydro CBD tincture is a fully water-soluble, nanoemulsified formula that offers superior bioavailability in a multi-use tincture form. Use as a traditional tincture or add it to beverages or food products and consume as desired throughout your day. This ‘unflavored’ product has a natural, ‘hempy’ flavor. Unflavored refers to the fact that no additional flavoring is added. Comes in a 1 oz (30 ml) bottle. Due in stock mid-late April. To be notified when this product comes in stock, subscribe via the email form found in the website footer. If you prefer liquids to capsules, our Hydro CBD Tincture is for you! This product features a fully water-soluble formula that employs the same nano-sized microemulsion manufacturing process that you’ll find in our softgels. 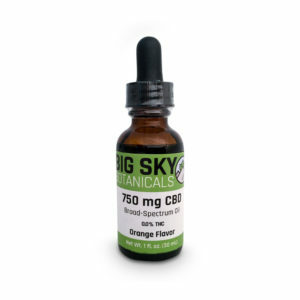 Enjoy the same superior bioavailability in a multi-use tincture form. This product has a natural, 'hempy' flavor. The beauty of this product is its convenience and versatility. You can take it straight from the bottle as a traditional tincture or you can add it to beverages or food products and consume as desired throughout your day. The water-soluble formula ensures that when added to water, the tincture completely assimilates through the liquid rather than floating on top as oil-tinctures do. Inside each bottle, you'll find the highest quality hemp extract available. Beginning life as organically grown, non-GMO, Colorado-raised industrial hemp, our extracts are created using food-grade ethanol extraction or supercritical CO2 extraction methods in GMP compliant facilities. Then, through a proprietary chromatography process, the full spectrum extract is stripped of THC. The result is a broad spectrum hemp extract that includes all the naturally occurring cannabinoids, terpenes, and flavonoids found in the original hemp material without any detectable levels of THC - guaranteed! You can rest assured that our hemp extracts contain everything you want and nothing you don’t. Each batch of products is lab tested to ensure that no heavy metals, solvents, microbes, or contaminants are present. Get ready to experience the purest, most bioavailable hemp oil on the planet. 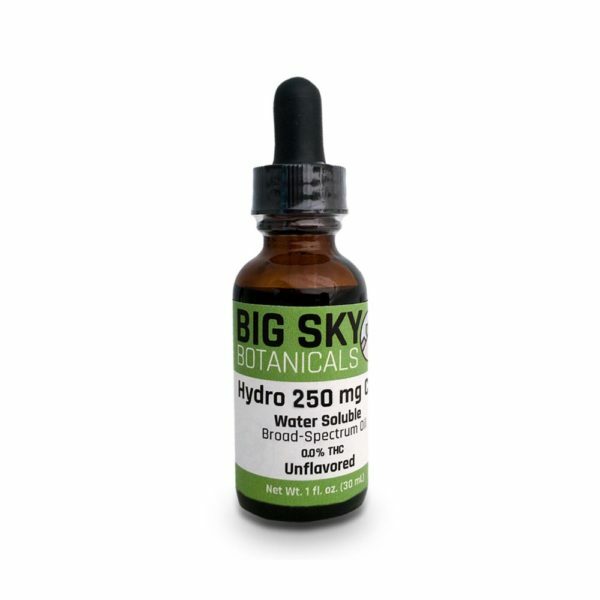 Of the many features that set Big Sky Botanicals' Hydro CBD tincture apart, the proprietary nano-microemulsion manufacturing process is perhaps the most notable. 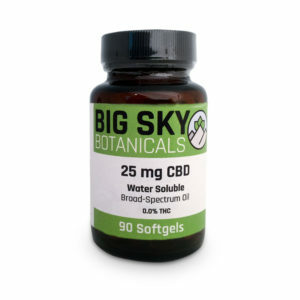 The phytocannabinoid-rich hemp extract contained in each capsule undergoes a special process that breaks the oil into the smallest particulates possible. This process significantly increases absorption rates in the body when compared to standard oil-based products as well as other emulsified products on the market. As shown in the diagram below, the competition’s liposomal microemulsion process yields hemp oil droplets between 100 and 1000 nanometers (nm) in size. With our superior nanoemulsion, the droplet size is 10-100 nm, with an average drop size of 25 nm. This small droplet size allows for the largest accessible surface area of hemp oil droplets that maximizes the body’s ability to synthesize and respond to any given dosage. As with any supplement, it’s not how much you consume, but how much your body absorbs that matters. 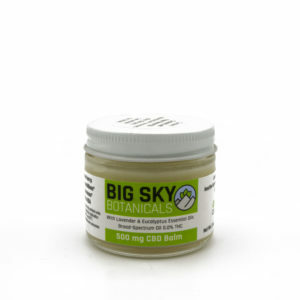 With standard oil-based CBD products ingested orally, 10% or less of the hemp extract is absorbed by the body. Our nano-sized droplets address this problem directly, increasing absorption rates up to five times, resulting in more than 50% of the extract being absorbed by the body. This means a lower dose is required to achieve greater potential health improvements overall. Our products are priced competitively, even against traditional standard oil products so you get the absolute best bang for your buck. For more information, see our article which explains water-soluble soluble CBD in-depth. For best results, shake tincture well prior to use. As a traditional tincture: place one dropper full under the tongue and hold there for 60 seconds, then swallow. As a water-soluble additive: add the hydro tincture to water or other beverages, mix well, and consume as desired throughout your day. Active Ingredients: Phytocannabinoid-Rich Hemp Oil. Inactive Ingredients: Vegetable Glycerin, Quillaja Extract, Water, Stevia, Orange Flavor.